Do you keep track of how much water you drink throughout the day? For a lot of people, drinking the recommended amount can be difficult. 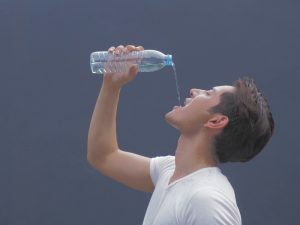 They are aware of how important it is to make sure that their bodies are always hydrated, and there is a long list of benefits that comes with it, but they tend to get too caught up with school or work. If you consume at least eight glasses each day, as the experts advise, you can ensure that your health and well-being are well taken care of. Water can help you shed off those excess pounds. If you are struggling with your weight, there are many things that you must change in your lifestyle and habits to get on the right track. It will definitely be a major challenge that will test your determination and willpower. First of all, you have to remove unhealthy food from your usual diet, such as chips, sweets, and fastfoods, and swap them with healthy options, like fruits and vegetables. In addition to that, you need to cut down your consumption of soda and alcohol, and replace them with water. Because water has 0 calories, you can drink as much of it as you need to. Every time you feel hungry, drink a glass to suppress it. Oftentimes, these hunger sensations are only calls for hydration by your body and not exactly for food. Before a meal, drink a big glass of water to fill your tummy. Doing so may make you feel a bit full and eat less. Water can help eliminate toxins in your body. Toxins that stay inside our bodies for a long time can trigger various health problems. They exist in the environment, in the air. They come from the sun’s radiation, pesticides, trash, car exhausts, and sewers. They are present in the food that we eat and the liquids that we drink. They also exist in your perfume, hairspray, bodywash, make-up, and other personal products. Your dishwashing liquid and floor cleaner? Yes, they have toxins too. If they find their way into our systems, it is essential that they are flushed out as soon as possible to avoid complications. Water has the ability to get rid of these toxins. If you drink enough water, your body is able to get these harmful contaminants out of you through sweat and urine. The more water you drink, the better. If you fail to do so, these toxins will accumulate inside your body, and put you at risk of medical problems, like constipation, kidney stones, and urinary tract infections. Water is a good way to kickstart your day. In the morning, as soon as you wake up, drink a glass of water. Do this despite not feeling thirsty. Your body needs to be hydrated right away because it has gone 6 or more hours straight without anything while you were asleep. With a glass of water, your metabolism is revved up and your energy boosted. You will feel less groggy and tired, and actually be more awake and alert throughout the day. You can do tasks in school or at work more efficiently. Water can keep you energized. If you like to watch sports, you surely have noticed how after running up and down the field for several minutes the players start to move slower. That is because the exhaustion has kicked in, and they need to catch their breaths and get hydrated. Doing physically demanding activities takes a toll on the body. Whether you are a world-class athlete or a regular Joe, there will come a time when your body just could not take it any longer. The moment you feel that you are closing in to that breaking point, it is best that you drink water right away to invigorate and revive you. Water helps prevent muscle cramps, sprains, and other injuries. For athletes, hydrating is of utmost importance. With enough water in their bodies, their cells, tissues, muscles and joints can do their jobs well, and they can perform to the best of their abilities. 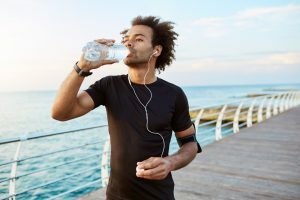 If you play basketball, volleyball, or some other sport; have a daily workout routine; bike several kilometers to work; or have a more active lifestyle than average, you have to ensure that you are feeding your body the recommended amount of water for the level of physical activity that you do. Otherwise, you will suffer from injuries, and fall short of your goals and responsibilities. Water helps improve your skin. Many skin problems are a result of not getting enough water. Just like the heart, lungs, kidneys, and brain, the skin is an organ that needs sustenance to function properly. If your skin is adequately hydrated, it will be soft, smooth, and glowing. Your will less likely have to worry about acne, pimples, dryness, and flakiness. Also, as you grow older, your skin starts to develop wrinkles. But, with enough water, you can impede the aging process, and keep looking radiant, fresh, and young. Thus, in addition to your regular use of natural and organic skin care products, remember to drink at least 8 glasses of water each day for healthy skin. Did you know that over 80 million people on earth have bad breath? Yes, it is that common of a problem, and it can be prevented by drinking water. If you drink at least 8 glasses of water a day, you can protect yourself against this embarrassing condition. Of course, you still have to brush your teeth after every meal, and floss at least once a day. But, if you add to that routine the habit of drinking enough amount of water, you are less likely to find yourself in a situation where you see people cover their noses or stand as far away from you as possible every time you open your mouth.